Stomach, Forestomach - Ulcer in a male F344/N rat from a chronic study. A portion of the epithelium is absent, exposing the underlying submucosa. Stomach, Forestomach - Ulcer in a male F344/N rat from a chronic study (higher magnification of Figure 1). There is some inflammation associated with the ulcer. 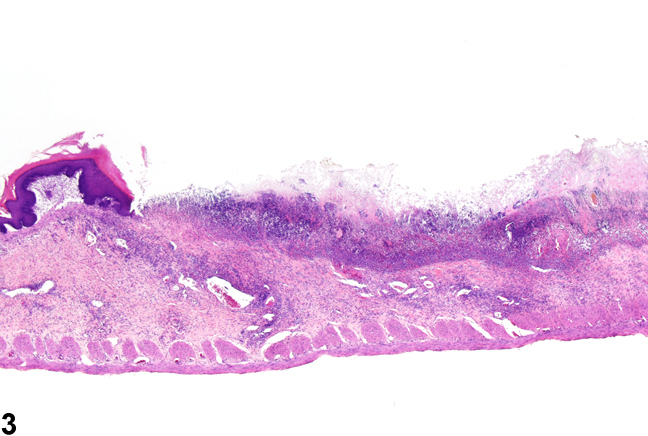 Stomach, Forestomach - Ulcer in a male F344/N rat from a chronic study. 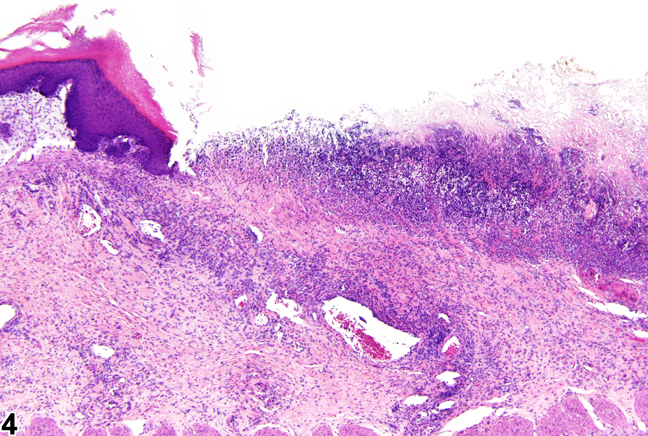 A large portion of the epithelium is absent, exposing the underlying submucosa. Stomach, Forestomach - Ulcer in a male F344/N rat from a chronic study (higher magnification of Figure 3). 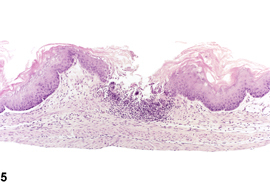 A significant amount inflammation is associated with the ulcer, as well as hyperplasia of the adjacent epithelium. Stomach, Forestomach - Ulcer in a male B6C3F1 mouse from a subchronic study. 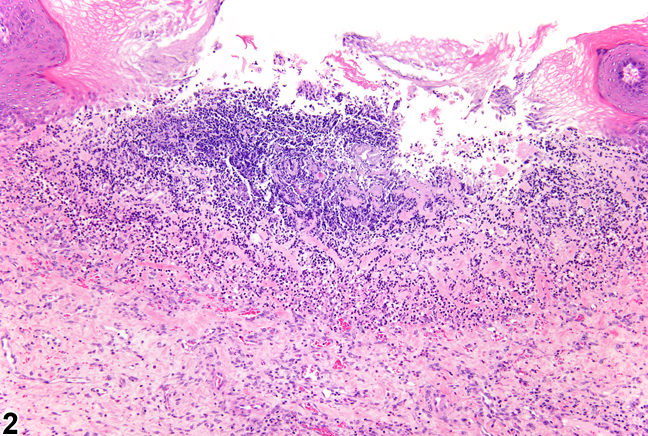 A large portion of the epithelium is absent, exposing the underlying submucosa. 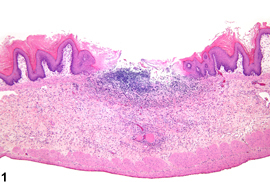 An ulcer ( Figure 1 , Figure 2 , Figure 3 , Figure 4 , and Figure 5 ) is defined as the loss of all epithelial cell layers extending through to the submucosa, whereas an erosion is the loss of superficial epithelial layers of the mucosa. Inflammation at the base of an ulcer and in adjacent tissue and hyperplasia of the adjacent epithelium are very common associated findings. Forestomach ulceration is a common background finding. The forestomach is the most common location for ulcers, but they may occur throughout the gastrointestinal tract. Ulceration of the forestomach can be caused by gavage accidents, or they may be treatment related (especially when the test article is an irritant). However, in many cases the exact cause of ulcers is not known. Ulcers of the forestomach should be diagnosed whenever present. They should be graded based on the extent, number, and depth of the lesions. Secondary lesions, such as edema, inflammation, and hyperplasia of the adjacent epithelium, are not diagnosed separately unless they are prominent components of the lesion or they are considered a primary lesion (e.g., the hyperplasia occurred prior to the ulcer). 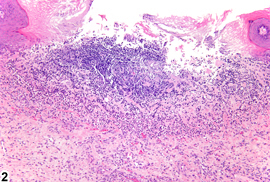 Necrosis of the epithelium is diagnosed instead of ulcer if the necrotic epithelium is still present and attached to the underlying lamina propria (see Stomach, Forestomach - Necrosis).